Kitchenware There are 67 products. Love Skulls? Then look no further than this glass storage jar! A Viking warrior's most treasured amulet, 'Mjolnir', the Norse god Thor's mighty weapon of utter destruction. And upon the traditional Celtic knotwork strapping, the inscribed runes translate to 'May Thor protect this hammer and charge it with the power of the thunder storm'. Perhaps it means the beer? Matching coasters available: CC6 & CT8 A high quality bone China mug with jet black colour glazing and beautiful rose gold printing. This mug has an approximate capacity of 400ml/ 15oz and is microwave & dishwasher safe. 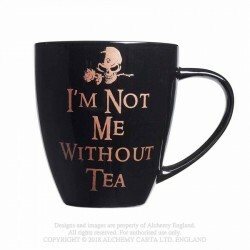 A beautiful rose gold edition mug decorated with the slogan 'I'm Not Me without Tea' Can't function without your morning cup of tea. Then this is the mug for you! A high quality bone China mug with jet black colour glazing and beautiful rose gold printing. This mug has an approximate capacity of 400ml/ 15oz and is microwave & dishwasher safe. Matching coasters available: CC5 & CT9 A high quality bone China mug with jet black colour glazing and beautiful rose gold printing. This mug has an approximate capacity of 400ml/ 15oz and is microwave & dishwasher safe. 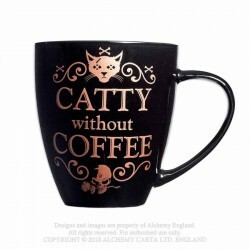 Matching Coaster available: CC9 A high quality bone China mug with jet black colour glazing and beautiful rose gold printing. This mug has an approximate capacity of 400ml/ 15oz and is microwave & dishwasher safe.